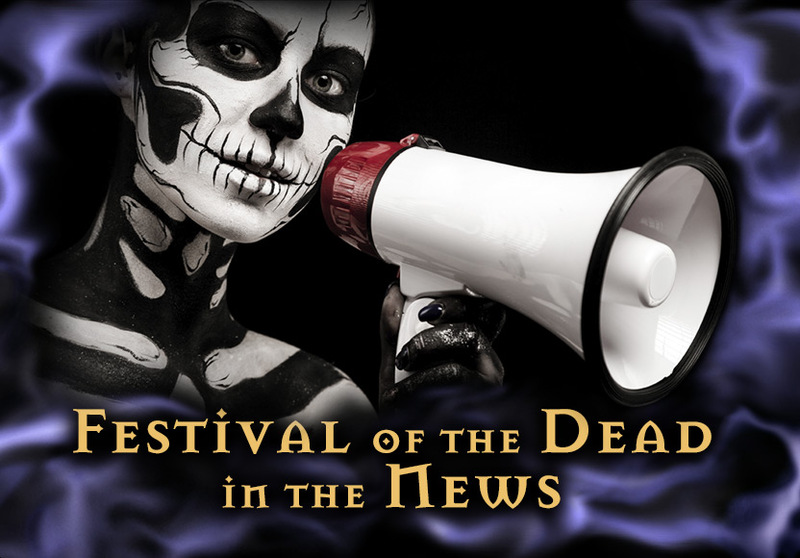 Festival of the Dead hosts Christian Day and Robert Murch were interviewed by Associated Press for this article on the quest by some to change Salem’s image. While Salem's new branding “expert” feels that Halloween tourism is a 500 pound gorilla that nobody needs to talk about, we believe that anything of real value takes hard work both to create and to maintain. We prefer to keep some bananas on hand for proper feeding! This article made local newspapers across America, as well as top story of the travel sections of abcnews.com, usatoday.com, and was the top story on the homepage of cnn.com! SALEM, Mass. (AP) A witch flies on the side of this city's police cruisers, swoops past the local paper's masthead and leads Salem High into battle as its mascot. This is undeniably the ''Witch City,'' even if not all residents are comfortable about renown rooted in the evil of the Salem witch trials of 1692. But some wonder if it's time for Salem to expand its reputation beyond witch hysteria, and the kitschy spook industry that's grown up around it. Now, tourism leaders have hired a marketing consultant, the first step in a campaign to retool the city's image by focusing on its significant, but lesser known, cultural assets. Mark Minelli of Boston's Minelli Inc. points out that Salem has the House of Seven Gables made famous by the Nathaniel Hawthorne novel of the same name along with abundant Federal-period architecture and an engaging seaport past. It also has momentum from a $125 million renovation of the Peabody Essex Museum that has turned it into a major draw. No one wants to whitewash the witch, Minelli said, but efforts must be made to attract a different kind of tourist one who will stay longer, spend more money and make tourism less dependent on the annual flood of Halloween visitors. ''You can't expand upon it,'' Minelli said. ''It doesn't have another dimension. ''A lot of people don't want Salem associated with a negative blot on history, even if it draws people by the thousands,'' Day said. Salem attracts about 800,000 people annually, according to counts at its visitor center, and at least another 200,000 who never check in there, said Carol Thistle of Destination Salem, which promotes local tourism. The Halloween season accounted for 20 to 25 percent of all tourist visits between 1996 and 2001 more recent statistics were not available and brings in more than its share of dollars. For instance, $30 million of the estimated $90 million in tourist dollars spent in Salem in 2000 were spent in October, according to figures provided by Destination Salem. No one takes the Halloween boom for granted, said Mark Meche of the Salem Main Street Initiative, which promotes downtown businesses. It's what happens after Oct. 31 that's the problem. Monthly tourist visits generally don't reach six figures again until midsummer. In the meantime, some fright purveyors make so much money in October that their attractions are all but abandoned until the next fall not ideal for any business district. A key to expansion plans is the renovation of the Peabody Essex Museum, which featured the piece by piece transplantation of a home from rural China to Salem. Museum spokesman Greg Liakos said attendance has tripled, from 65,000 to about 200,000, in the six months since the June opening, compared to previous years. ''It's an opportunity we'd be crazy to waste,'' Minelli said. The museum draws the kind of culture-seeking tourists who can be redirected to lesser-known historic sites, he said from the 1797 replica merchant vessel Friendship, docked at Salem's waterfront, to a collection of Federal period homes lining Chestnut Street, touted by locals as one of the most beautiful streets in the world. They can spend their extended stay in a new hotel, currently under construction. Minelli's marketing proposal, with the theme ''if you think you know Salem, think again,'' extends beyond tourism, with business and real estate leaders encouraged to help promote Salem as a good place to live and work. That kind of coordinated outreach to a new audience simply hasn't been done, said Thistle, who said Minelli's initial presentation to local leaders cost $25,000, and at least $100,000 will be needed for a future marketing campaign. Day said he's all for promoting Salem's hidden attributes, but added that it's a waste of money if they ignore the one thing that makes it unique the Salem witch trials. Boston is just a few miles away and offers as much, if not more, architecture and history, not to mention the Museum of Fine Arts. ''You will never compete with Boston, you just won't,'' Day said. Bob Murch, creator of Cryptique, a Ouija board dubbed ''the spirit board of Salem, Massachusetts,'' said a distaste for the Halloween industry including traffic jams and a belief that it exploits a tragedy has led to an identity crisis. Meche said that while some residents hate all things Halloween, others simply want a better balance of tourism. Liakos said the much of the kitsch associated with Salem's horror industry vampires, werewolves, haunted houses, etc. has nothing to do with the actual witch hysteria, when 20 people were executed and more than 200 imprisoned. ''When (the witch history) is used for the wrong reasons, it can be damaging,'' Liakos said. Paul Durand, an architect and incoming head of the Chamber of Commerce, said Salem's witch-related industry will thrive even as the city focuses on promoting its other historic assets. But he said people don't want any more of it.